Some of you may remember me telling you of my nephew's death last November. He was only 15 and died from huffing gasoline. The family is having a benefit to help raise money for his funeral and to raise awareness of inhalant abuse. 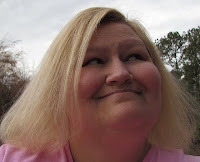 I know most people who read my blog live too far away to come, but some of y'all live in the area. If you do, and could come, we would greatly appreciate it. If you click on this flyer, I hope it will enlarge for you. If not, here are the details. 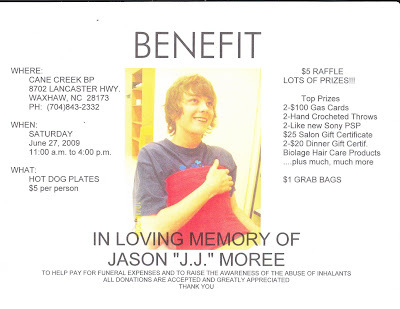 The benefit will be Saturday at the Cane Creek BP, 8702 Lancaster Highway Waxhaw, NC 28173. If you need directions the store's phone number is (704)843-2332. This is on Highway 200 below Monroe on the way to Lancaster. It will be from 11 am till 4 pm and there will be food and raffle tickets for prizes. Thanks! This is so sad. He was so young. I hope you are able to raise enough money for a funeral...how are his parents? How is the rest of the family? Such a tragic loss . That is sad. I wish them all the best with raising money at his benefit. This is sad. Your nephew was a handsome boy. I wish Y'all all the best with the benefit. This is so sad! I'm so sorry! I wish I lived close enough to come! I hope lots of money is raised and awareness on this subject too! Hun, if I lived closer, you KNOW I would be there! Such a sad thing... and such a waste of a beautiful life, but hopefully you can raise some awareness - and pay those expenses!